Max graduated with a Bachelor of Visual Arts from Sydney College of the Arts (SCA) and a Studio Masters in Printmaking from UNSW Art and Design. 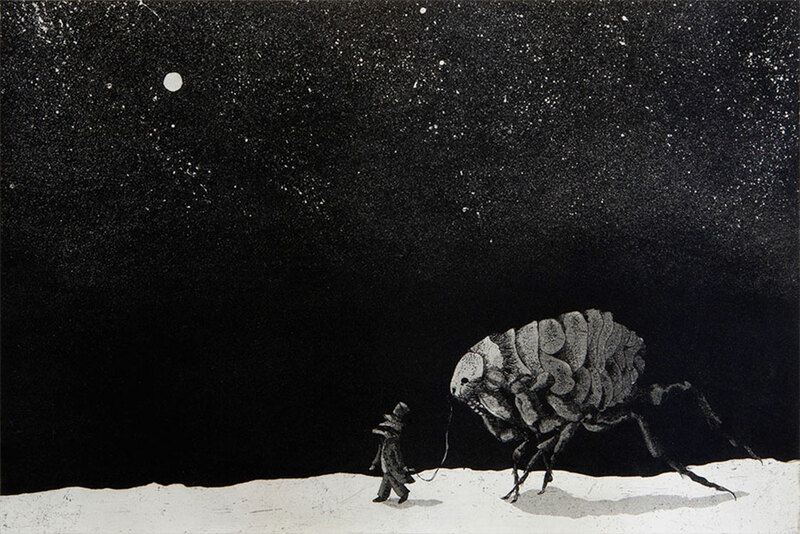 He spent 2013 co-running Varietê Gallery in Guadalajara, Mexico and presently lives and works in Sydney. He is currently working on a fictional narrative based in a world ruled by badgers set 3000 years in our future. Geraldine became a very good friend that I first met at Warringah Printmakers Studio many years ago where she was an active member and also through Primrose Paper Arts that she helped establish with Ruth Faerber setting up a facility where hand made paper could be created. Geraldine served as President of Sydney Printmakers for many years and was always busy helping organise exhibitions for the group. When I first joined Sydney Printmakers in 2005 I remember Geraldine and Helen Mueller working very hard planning the ‘Collaboration’ exhibition which travelled throughout NSW and onto Queensland. Then again Geraldine and Gary Shinfield organised an extensive touring exhibition in 2011 and 2012 to help celebrate Sydney Printmakers 50th anniversary. Geraldine was always a pleasure to work with tirelessly devoting her time to Sydney Printmakers and other organisations she was associated with. She will be missed by us all. Geraldine Berkemeier enjoyed a life that made a significant contribution to the cultural life of Sydney. Not only was Geraldine a highly regarded artist who addressed the rigorous conceptual concerns inherent in contemporary art practice, she also possessed an innate ability, that was regularly deployed in her individual and collaborative projects, to be creative in the moment. To give free reign to her intuitive intelligence when engaged in the process of making, an approach that embraced a playful interaction with material and mark. In addition to this Geraldine was a patient and resourceful administrator throughout her period of service as President of Sydney Printmakers. She was generous and smart, providing this broad community of print artists, with new paths to follow that confronted and enthralled. But when one is blessed with such consummate personal and professional skills, it should be no surprise that you are in demand as an educator. Geraldine taught for many years at the College of Fine Arts that was to become UNSW Art & Design in Paddington. Her courses were designed to encourage participants to take risks in their introduction to both paper and print. She was thorough, engaged and informed, capable of great insight when nurturing an individual’s developing artistic voice. I always got the impression that Geraldine realised how fortunate it is to be an artist, charged with the responsibility to make a positive contribution to the world. With her passing I have realised what a precious thing this is and how important it is not to forget. Her memory will live on in the work that she created and by the people who loved and respected her. In the studio working together there were times when her intelligence and creativity were dazzling, shaping images into new and unexpected directions. Her image making was always driven by an underlying concern for the environment and the beauty of the Australian landscape. As an artist she had a great gift for translating the subtle textures and colours of the bush into images of authenticity and beauty. It was a privilege to know her as a friend, to work together in the studio and to share time exploring the country on our adventures. Geraldine and I decided to work together for the Sydney Printmakers Exhibition ‘Collaborations’ at Gosford Regional Art Gallery. We had both seen a documentary on the sinking of the Batavia and related events, a little known part of Australia’s history. Geraldine favoured research before making, and I can hear her saying, “let’s go”. The next image I remember is a fearless Geraldine sitting next to a very young pilot in a three seater light aircraft flying west over the Indian ocean into the unknown. As we banked and flew around the actual site of the sinking of the ship she was enthusiastically documenting with camera. We landed on an uninhabited island. Our pilot changed into snorkelling gear and within minutes we were snorkelling over purple sea plants and ochre coloured rocks. I lagged behind trying to keep a grip on the situation as I followed Geraldine’s flippers. Basil Hall took us into an Art Centre that had been neglected. The studios had been taken over by alcohol loving locals, sleeping on stinking mattresses. My reaction was to take the first plane out, but a very cool Geraldine urged me to hang on. The next day the same boys who we found sleeping with hangovers were our guides up the mountain to the most wonderful rock art sites. They told us stories and were glad to share their knowledge. They were our protectors. We decided to show our collaborations in places that had inspired them. In Darwin less than a dozen people had visited the gallery over a ten-day period. On the last day, a Sunday about 11 am, a woman cycled in and looked at the show. This was Allison Grey, a curator from the Art Gallery and Museum of the NT, and three works were purchased for the collection including the work ‘Abrolhos’. Geraldine came up with the title of our exhibition. The highlight of working together was the exhibition at Manly Art Gallery in 2005. We took the show to Fremantle, Darwin and the Gold Coast, supported by an Australia Council New Work’s grant (application written by Geraldine). 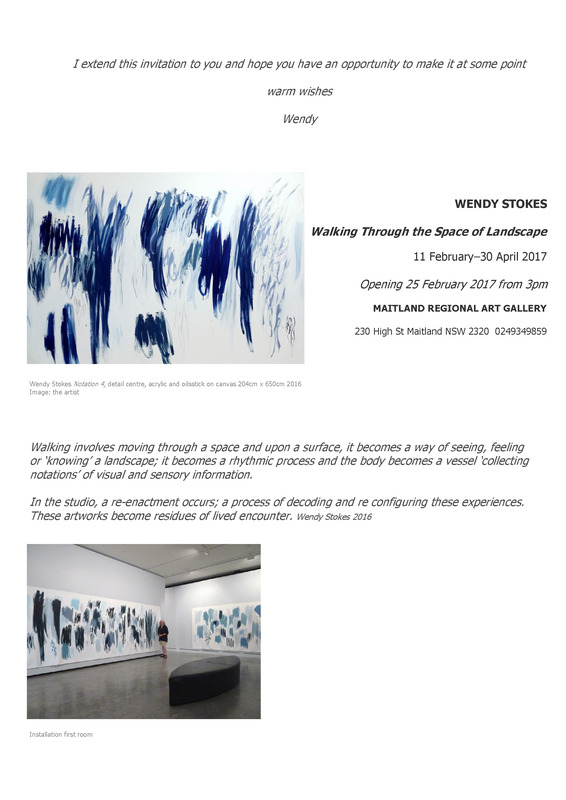 We went on to collaborate on the exhibition Crossing Boundaries at Maitland Regional Art Gallery. This body of work was based on journeys mapping the Hunter River in NSW. Geraldine’s research led us to a property high up on the Range where we searched in swamps and bogs for the source of the Hunter. A message from Stephen Andrews. 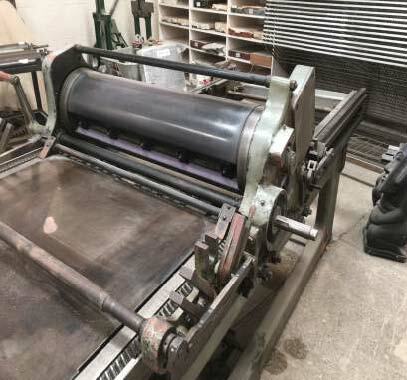 I am helping a friend to dismantle a substantial private print studio in the Western Suburbs. All of the printing equipment and accessories are for sale. Inspection is by appointment. If anyone has an interest in particular items I can supply more details and photographs. 50 tier metal drying rack spring-lift shelves on castors 40” x 63 1/2”. Printer’s imposing stone: 3” solid cast, machined top, 28” x 40”. Stainless steel wash-up graining sink + grit trap system: 42” x 42”. 2 steel levigators, 10” & 12”. 3 large litho ink rollers: 1 solid rubber. 2 leather cap with stands. Sundry equipment: including flammable waste bin, oil cans, inks etc. Ben Rak Exhibition at Manly Art Gallery. Opening Friday 28th October until December 4th. Artists talk Sunday November 6th at 3pm. This new body of work draws together processes and ideas from his cross-disciplinary art practice to reveal a considered search for ‘authenticity’ in Rak’s work. While seemingly minimalist, the work has gravitas, made possible through a deep conceptual engagement with technique and the refinement and articulation of his core creative interests. Through the artwork, Ben Rak plays with the notion of a hierarchy and chronology of painting over printmaking; in this case, which comes first, the painting or the print? 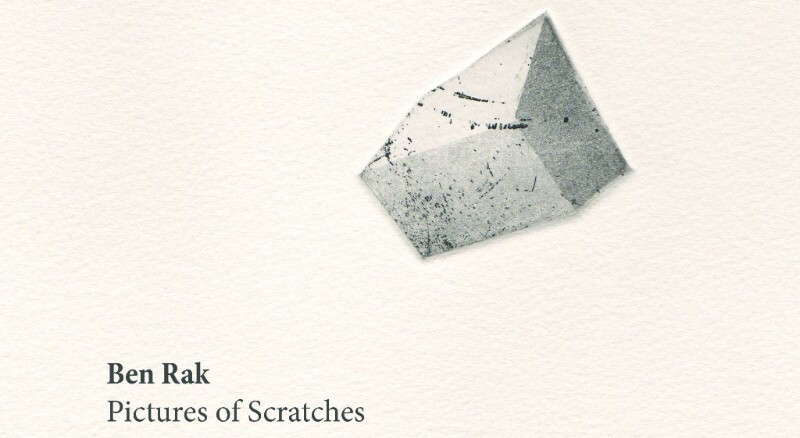 He also plays with the idea that the artist’s ‘mark-making’ is intellectually based instead of incidental or accidental. Rak directly challenges the audience to consider the intention of the artist and to examine what is contained and conveyed through the work. The NSW Government is withdrawing funding for art courses from TAFE from January 1st next year. Please sign the petition to protest. This petition of citizens of NSW brings to the attention of the NSW Legislative Assembly the urgent need for maintaining funding for accessible art education in TAFE. The cultural sector is an economic force, contributing over $30 billion to Australia each year – the arts not only create jobs but also create communities that are more vibrant, cohesive, healthy and innovative. TAFE in NSW puts the ability to make art in the hands of people, without regard to their age, wealth or background. On September 11 the NSW government announced that it would stop funding art education in TAFE, leaving 4000 students without access to finishing their courses in 2013. TAFE Art courses are the main provider of art education in NSW, with many prominent artists getting their first ‘hands on’ training in TAFE. The withdrawal of funding will mean that only the wealthy will be able to afford private art education and NSW will suddenly find it no longer has emerging artists with skills coming through.